What better way for medical professionals to demonstrate their cleanliness and professionalism than with great employee uniforms? Particularly in the medical field, it is essential to keep the facility, and medical equipment sanitized and well-maintained at all times. In addition to sanitized facilities and equipment, it is also crucial for medical employees to present themselves professionally as well. What better way for medical professionals to demonstrate their cleanliness and professionalism than with great employee uniforms? With sanitized and well-kept scrub rentals, your patients will know that they are receiving care from a sanitary and professional facility with an excellent team of medical professionals. 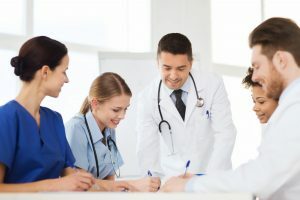 If you are now planning to invest in new medical uniforms for your team next year, consider the many benefits of medical uniform rentals for your facility in 2019. Because your patients will often develop an opinion on a medical center based on the cleanliness of the facility, equipment, and staff, it is crucial to ensure that all medical uniforms are clean, maintained and always in excellent condition. Medical uniforms such as such as scrubs, lab coats, and doctor coats should always be professionally presented to ensure the health and safety of the patient as well. Since these uniforms often take on significant wear and tear over time, they may begin to look worn without the right maintenance. With this, poorly maintained medical uniforms can also enable patients and families to form negative impressions of your medical facility, and these impressions connect to their impression of the medical care that they will receive at your facility. By renting your medical uniforms with Lord Baltimore for 2019, you are also ensuring that your uniforms are cleaned and maintained with careful attention to detail. Additionally, any irreparable uniforms are replaced with a fresh set for your team. Uniform service for your medical uniform rentals can help to eliminate the stress of providing and maintaining uniforms for your team in 2019. Medical uniforms can easily become tattered or worn out over time, and the costs of replacing them may even lead to costly expenses for medical facilities. Renting medical uniforms for your team can help to eliminate the stress of replacing and washing them. A uniform rental service may also be especially useful for facilities with high turnover rates or a growing team throughout the year. This entry was posted on Friday, November 30th, 2018	at 8:00 am	. You can follow any responses to this entry through the RSS 2.0	feed. Both comments and pings are currently closed.